While public gardens typically offer educational programming for adults and elementary schoolaged children, the teenage audience has been largely underserved. A new study examined the institutional benefits, challenges, and strategies of offering successful programming for youth aged 13 years. 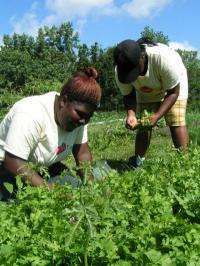 The researchers hope their findings motivate staff at public horticultural institutions to create and implement positive development opportunities for teens. A research team surveyed institutional members of the American Public Gardens Association, and followed up with intensive case studies at two large institutions and phone interviews with three smaller institutions. The objective of the research was to determine what specific institutional benefits could be derived from offering long-term adolescent programming and to articulate potential challenges and specific strategies of running successful programs. Keelin Blaith Purcell, Robert E. Lyons, Lynn D. Dierking, and Helen Fischel published the results of their research in HortTechnology. The researchers developed a questionnaire that was distributed via e-mail. A pre-survey letter was mailed to all contacts one week before sending the questionnaire, and a follow-up survey, was sent to directors of institutions who indicated they offered long-term adolescent programming. Additional data were gathered through case studies at Chicago Botanic Garden and Brooklyn Botanic Garden. Survey findings revealed that 65.8% of institutions offer adolescent programming, though only 28.9% offer long-term programming. "A key result of this study is that the adolescent audience, on average, is served less than any other audience, indicating a potential opportunity for program expansion", noted Keelin Purcell, main author of the report. "While a majority (65.8%) of the institutions that participated in the study offered some type of adolescent programming, only 28.9% offer long-term programming, even though research suggests that these programs can have a greater impact on the youth and the institution." The study identified seven institutional benefits to offering programming for teens. According to the report, major benefits include building relationships with new audiences who may be future employees or contributors, building interest in horticulture and environmental issues (including career interests), and supporting the institution's mission and growth. Minor benefits included: helping the institution contribute to and build the strength of the community, providing an inexpensive labor source, bringing in new energy, ideas, and perspectives, and providing new funding opportunities. The research also featured a list of seven strategies that may be useful in conceptualizing, planning, and evaluating adolescent programming at public horticulture institutions. Strategies encompassed recommendations for staffing, curriculum, partnerships, activities, and program evaluation. "This study demonstrates the potential for public horticulture institutions to make real and major differences in the lives of adolescents who live in their local community. In return, adolescent programming can help to grow the current and future audience of a garden, build interest in horticulture, and provide new inspiration and meaning to its organizational mission", concluded Purcell.